Mark and I spent Saturday foraging for an evening feast. Such riches we found! The first harvest was pokeweed. Plants in full sun had lots of red in the stems; in the shade the stems were green and more tender. Since there was so much, we could be picky and harvested only the choicest plants. As we moved along the pokeweed path we found tons of wild onions. 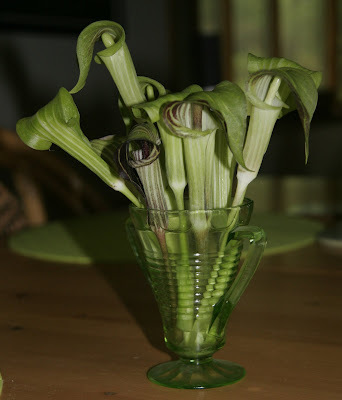 We were amazed at how easily they pulled up; the smell was wonderful and pungent. Wild onion is much easier to clean than field garlic. Next time I'll dehydrate, then pulverize them, to make my own onion powder. We found a little milkweed (milkweed season is just beginning), some asparagus (it's the end of asparagus season), and lemony dock leaves. Then we left the sunny fields and headed for the woods. 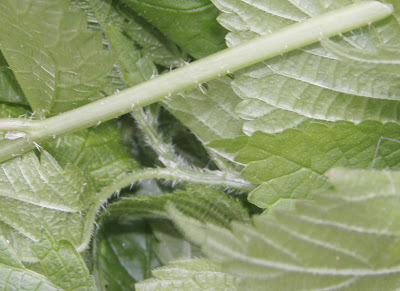 I had hoped to find stinging nettles but alas we did not...instead we found wood nettles a-plenty! Sam Thayer describes wood nettles as even more delicious and just as sting-y as stinging nettles, so I was pretty excited. 3) nettle gnocchi w/mushroom and wild onion sauce. I harvested the mushrooms from my front lawn last summer and froze them. That's what I call a Happy Meal, although I confess that the more I ate, the less I photographed. Please forgive me...I was otherwise engaged. We needed a new deck. The old deck was peeling, splintering, sagging and most importantly, pulling itself away from the house. Having just finished a bathroom renovation in the city, we were hyper-aware of everything that could go wrong, and the deck construction made me especially nervous since it involved my precious garden. The only way to dig three new footings was by driving a bobcat straight through two established garden beds. The night before our construction began I read Jayme Jenkin's post on contractor trauma, which did nothing to assuage my fears. I did everything I could think of to protect the plants (the red laundry basket in the above photo is covering two clematis! ), but in the end we were at the mercy of our G.C., Russ Cohen, to whom I am extraordinarily grateful. He listened when I explained how important the garden was to me (I'm pretty sure I didn't threaten bodily harm) and one week after the construction, the garden looks like it was never disturbed. Here are my suggestions for minimizing garden trauma during construction. Forgive me if some of them seem obvious, but when it comes to your precious garden, you can't be too careful! 1) Choose your contractor wisely. You may have to pay a little more for someone who actually listens to what you're saying, but making your priorities clear is essential. If your contractor is a gardener (or if his/her spouse is a gardener), you've got a head start. 2) Remove everything you can from the garden bed. I didn't want to move two large ornamental grasses (Chasmanthium latifolium) but when our start date was pushed back and the first new sprouts emerged I realized I'd better get them out of harm's way. It's a good thing I did because the garden soil was HIGHLY compacted by machinery and human traffic. I'm sure anything left underground would have been severely compromised. 3) Create a holding area for the plants you remove. I potted up lilacs, rose of Sharon, rhubarb, ornamental grasses, daylilies, irises, asters, mallow, and Phlomis, making them as comfortable as possible. Don't forget to water them during construction; they'll need extra TLC. 4) Protect anything you have to leave behind. I decided to leave three plants in place: a deeply tap-rooted Yucca filamentosa (at right), a wisteria just starting to bud, and two clematis. Clematis takes so long to establish; I knew if I dug them up I'd sacrifice bloom for the next few summers. 4) Go through the prepared garden with your contractor, pointing out spots to look out for. 5) Walk away. We were home for the demolition day but had to leave for NH on digging day; that turned out to be a blessing in disguise. We loaded the car as the bobcat began its work and the sight of it maneuvering through my garden was more than my sturdy nervous system could bear. 6) Say thank you! If your contractor did a bad job, if he ignored your requests to take care, let him know in no uncertain terms. And if he did a great job, spread the word. Conscientious contractors are hard to come by. Thank you, Russ Cohen! Happy Wisteria didn't miss a beat.